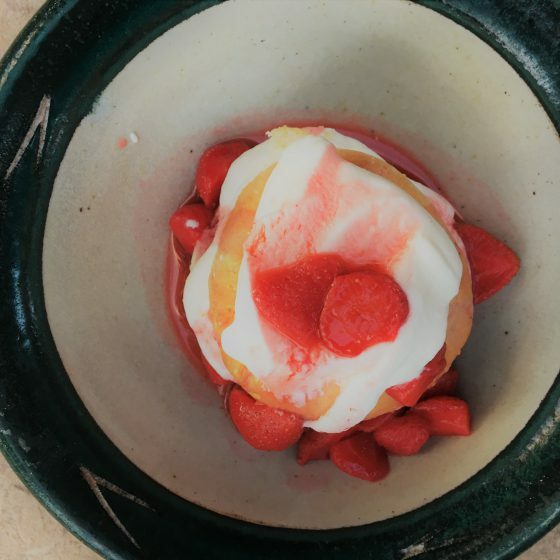 This is THE ultimate early summer dessert. 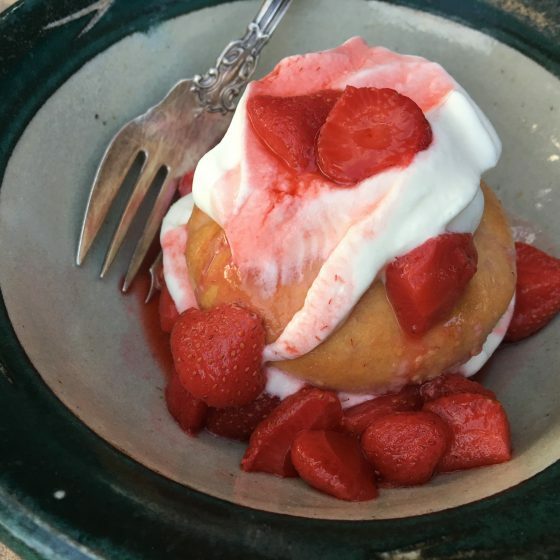 Sourdough biscuits make the perfect foil for ripe strawberries from your garden or local farmers’ market. Thinly slice strawberries. Add the berries, sugar, vanilla, and salt to a bowl and carefully stir them. Cover and set them aside while you make the biscuits. Sourdough Biscuits: Whisk the flour, baking powder, baking soda, and salt together in a bowl. Work in the butter with your fingertips until it’s fully incorporated and crumbly. In a separate bowl, whisk the sourdough starter, honey, and buttermilk together. Add the starter mix together into the flour/butter mix and stir it gently until it just comes together in a dough. Additional flour may be necessary. Turn the dough out onto the counter and knead it about 20 times until it all comes together. Pat the dough, flattening it until it’s about an inch high. Cover a baking sheet with parchment paper. Using a biscuit cutter (or a cup with a greased rim), cut the dough into circular biscuits and transfer them to the baking sheet, being careful not to pinch the sides. Set the baking sheet aside and allow them to rise and sour about 2 hours. Bake the biscuits for 8 minutes until fully baked. Remove from baking sheet and allow biscuits to cool. Gently slice biscuit in half. Whipped Cream: Add the cream, sugar, and vanilla to a bowl and whip it with a whisk until it forms stiff peaks (or use an electric hand or stand mixer). For an individual serving, place bottom of biscuit in a shallow bowl, top with whip cream, and then add the top of biscuit. Pour 1/2 cup to 3/4 of strawberry mixture on top of biscuit. Top with more whip cream. Listen to the “yuuuums”!